Home > Heart Conditions > Why Do Palpitations Occur? Palpitations are something that many of experience on a daily basis. These can be felt for a number of reasons, some serious, others not so significant. Many people are aware of their palpitations whilst many people do not feel anything, this can depend on whether the person is concentrating on feeling their heart rhythm. A palpitation is an unusual heart rhythm. Sometimes is can be felt like a flutter, other times it can be more frightening and feel as though the regular heart beat contains extra beats or pause in its rhythm.They can often feel very peculiar and occasionally cause discomfort. The heart may feel as though it is beating very quickly or more slowly than normal. Non- serious palpitations can occur as a consequence of over-exertion, nervousness or anxiety which can occur in many people. As a result in an increase in the hormone adrenalin which can cause a surge of energy in the body.Some smokers or people who consume large amounts of caffeine like those who drink lots of energy drinks or coffee may find that they suffer from palpitations. This type can be rectified by ensuring caffeine intake is limited and a healthy balanced diet is consumed.More serious causes of palpitations can include side-effects of many drugs, both legally prescribed and illegal recreational drug use which can lead to grave consequences.The most serious reasons for suffering from this condition could be because of heart problems including mitral stenosis, a thyroid complaint or due to some psychological disorders. For those of us who experience palpitations as a result of adrenalin increases, they Are not considered serious and can happen very frequently.If they occur for other reasons, for examples whilst the person is at rest, or are accompanied by chest tightening, shortness of breath or dizziness, it is advised that this is discussed with your GP whop may order some tests to discover if there is an under lying cause. 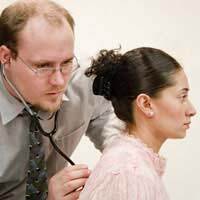 These tests can include simply listening to the heart with a stethoscope, an electrocardiogram (ECG) or some blood tests to check for thyroid function and some enzymes in the blood.If you experience palpitations, severe chest pain and breathlessness at the same time, seek medical advice as soon as possible to ensure this is not severe angina or a heart attack. Some instances of palpitations can be overcome by making some simple dietary changes, others can be treated by reducing stress levels or by being moderate with exercise and not over doing it. Immediate treatment includes resting and deep breathing to try and relax the body and reduce adrenalin surges.For those who have an underlying condition causing the palpitations, drug therapies or medical intervention may be necessary to help reduce them.Beta-blockers may be used to help regulate the heart rhythm, whilst others may benefit from the use of cardioversion whereby the heart rhythm is corrected using electrical impulses administered under general anaesthetic. Palpitations are extremely common and are harmless in the majority of circumstances, but for a few people, they may indicate a more serious condition that will need investigation or medical treatment.